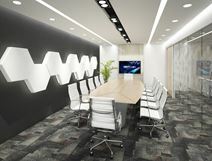 Within walking distance of Ortigas Park in the heart of Pasig this flexible office space is fully furnished and equipped with brand new computers with advanced specifications and systems. As well as office space the centre also provides access to meeting rooms ad dedicated IT support teams. This penthouse office space offers clients private serviced office, virtual and co-working office solutions on flexible terms that suit your business' needs. The centre comes fully equipped with high-quality and modern furnishings and fittings throughout and features a wide range of business services and facilities, including meeting and boardrooms and conferencing facilities. Tenants also benefit from access to the centre's roof deck lounge, which boasts inspiring views across the city. Office space prices ranging from ₱13000 - ₱18000 per month. Completed in early 2014 this Class A, PEZA-accredited 16-storey commercial building provides 28,400m² of leasable space. The area is home to a number of shopping malls, bars, restaurants and condominium skyscrapers and has a great nightlife. Sharing a home with the Union Bank of the Philippines along with a number of other major BPO players, this iconic Grade A, PEZA-accredited office skyscraper is located in the centre of Pasig City"s business district.